Below is a lesson in taking your time to do something right. In my case it applies to changing the oil in my car. In your case, it could apply to something else. A couple of weeks ago, I was going to change oil on our minivan. I do this regularly (4 – 5 times a year) so I am quite used to the process. This day, however, was different. Everything started out normal enough. In fact, I completely changed the oil and was ready to put the van back in the garage. This is when things took a turn for the worse. After backing the van off of it’s ramps, I noticed a trail of oil following me on the driveway. Upon further inspection, oil was oozing out. Quickly, I put the van back up on the ramps. And, here is where begins our lesson in taking your time to do things right. After determining the leak was coming from the new filter I had put on, I removed the filter. At this point I saw an additional seal from the old filter fall off (it should have come off when I originally removed the old filter). Aha! That would be the problem. However, I had used most of the motor oil I had at our house (and no one else was home), and I had drained the new oil I put in before I removed the filter as to not cause more spillage. So, then I put the new filter back on (without the extra seal), poured the oil back in, and started the van. And…the oil light stays on. So, I get out and look under the van (note: I should have done this earlier). 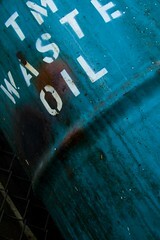 Oil everywhere. Well, I had forgotten to put the drain plug back in after draining the oil out. So while I poured the oil in, it just ran out on the driveway. Big mess, and I also had to scrounge around to find any oil I could use the get the van back and going again (my wife would need it the next day). In the end, I found some oil and got the van going. But, I did re-change the oil again the next day after buying more oil (the right grade of oil). Lesson learned. When things stray from normal, you need to take your time to make sure things are done right. Maybe that’s a checklist, or maybe it’s better mental preparation, or whatever works for you. But if you take the time to do things right, you will be much more satisfied in the end. And, my at-home oil change probably cost a bit more than had I went to the local auto shop.